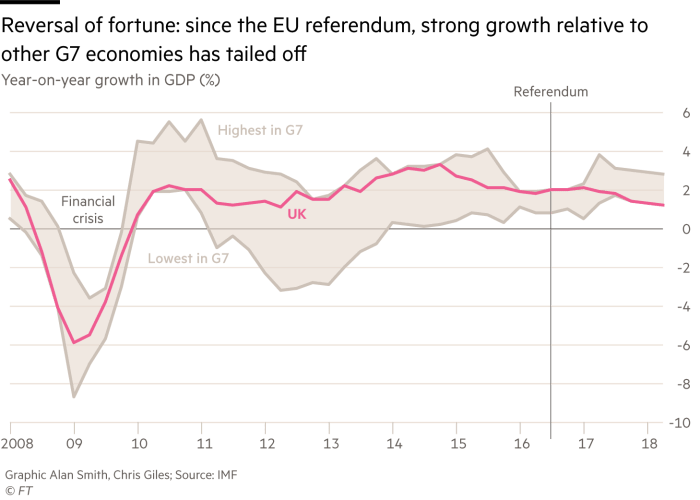 Britain’s economy has disappointed in the two years since the nation voted to leave the EU, with both remainers and leavers acknowledging that the data has generally been soggy, but not disastrous. MPs have headed off for the summer, leaving in their wake an ongoing political crisis over the terms of negotiations with Brussels and growing alarm over the consequences of a no-deal Brexit — including the spectre of stockpiling food and medicine. But consumers appear unfazed and have been spending with abandon, enjoying the royal wedding, the World Cup and a prolonged heatwave. The economic news for the rest of 2018 is unlikely to be as muted. Either a good deal will be negotiated with the EU, which would likely result in a jump in growth as Brexit uncertainty fades and businesses feel they can invest; or the prospect of a “no deal” or a “hard” Brexit will become impossible to ignore. These five charts highlight the main economic consequences of the 23 June 2016 vote and will be periodically updated and augmented. 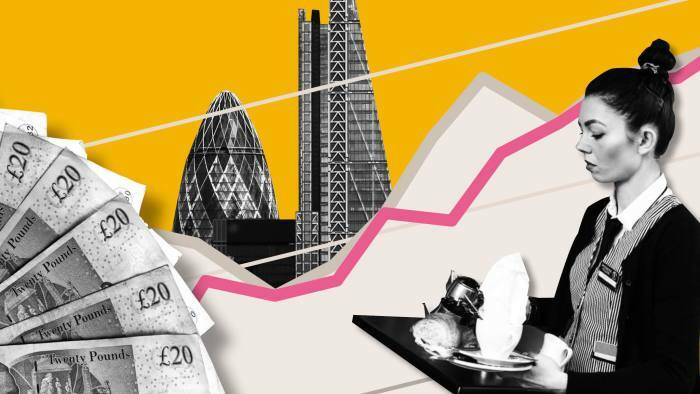 Britain’s growth rate has almost certainly bounced back in the second quarter from 0.2 per cent at the start of the year, when activity across the UK was hit by snowstorms and a prolonged cold snap. The odds are that when it is announced on August 10, the UK growth rate in the second quarter will still be stuck close to the bottom of the league table of G7 leading economies. France and the US have already released their figures and their annual growth rates — 1.7 per cent and 2.8 per cent respectively — are expected to be higher than the UK’s. FT research has shown that by the end of the first quarter the UK economy was about 1.2 per cent smaller than it would have been without the Brexit vote. The referendum inflicted damage primarily through a hit to household incomes from the 10 per cent dive in sterling, which drove up import prices. Even economists on the leave side now accept this, although they blame Philip Hammond, the chancellor. With the unemployment rate down to 4.2 per cent between March and May — its lowest rate since the mid 1970s — the labour market has strengthened significantly since the EU referendum. This is the main exception to the disappointing data. 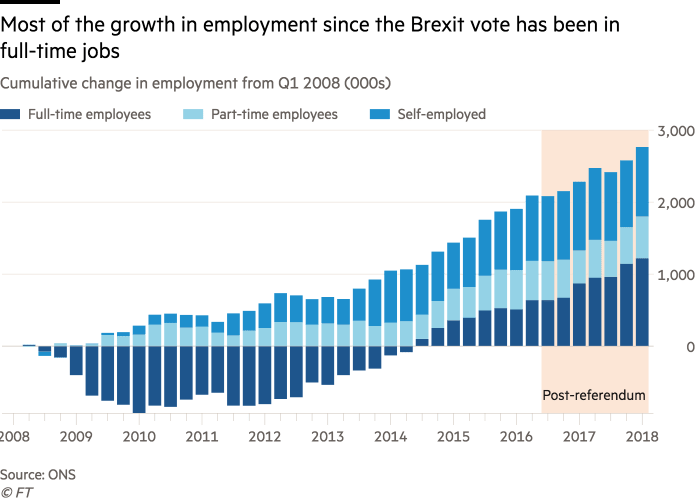 Not only is employment up, but most of the growth has been in full-time jobs; the number of people in part-time jobs and in self-employment has remained constant since the Brexit vote. The end of the boom in self-employment has reduced concerns that people were setting up in business because they could not find any other work. But although the overall picture is strong, not all is rosy in the labour market. Wage growth continues to be weaker than the Bank of England expects and the productivity performance of the economy has continued to disappoint, growing at an annual rate of less than 1 per cent. With wage increases not matching price rises in 2017, household real incomes have faced a nasty squeeze. But households appear to have thrown caution to the wind because this new constraint is almost impossible to detect in the expenditure data. In 2017, the savings ratio — measuring the proportion of income that is not spent — dropped to 4.1 per cent, its lowest rate for more than 50 years. 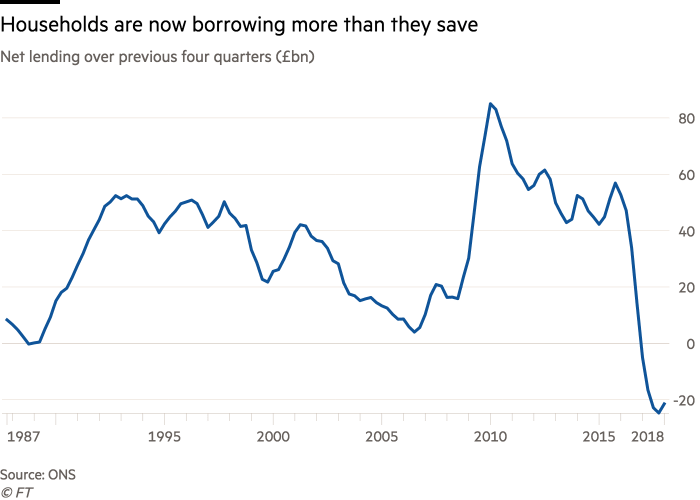 As a corollary of this, the household sector has moved into a net financial deficit, borrowing more than it is saving for the first time since 1988. Households clearly think Brexit will not hurt their finances and are spending as if the income squeeze of 2017 was just a pinprick. The danger for the economy is that households are more likely to increase their savings in future, slowing economic activity in the process. Spending is likely to be further constrained if the Bank of England increases interest rates to 0.75 per cent this week. An economy at full employment is normally one that stimulates plenty of new business investment as companies adopt new technologies to keep expanding without hiring new staff. 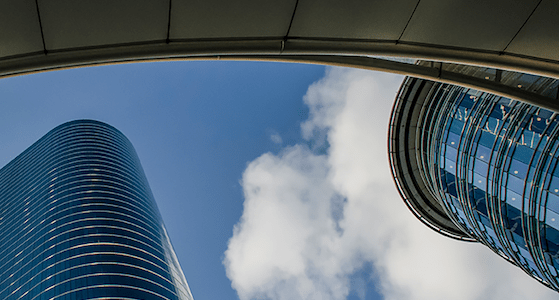 This was happening until 2015, but a combination of the drop in oil prices and uncertainties surrounding the Scottish independence referendum, the 2015 election and the EU referendum caused companies to think twice before committing themselves. In the first quarter of 2018, business investment was only 2.3 per cent higher than at the time of the Brexit vote almost two years earlier. Before the referendum, the Bank of England had expected business investment to have grown more than 13 per cent over the two-year period. 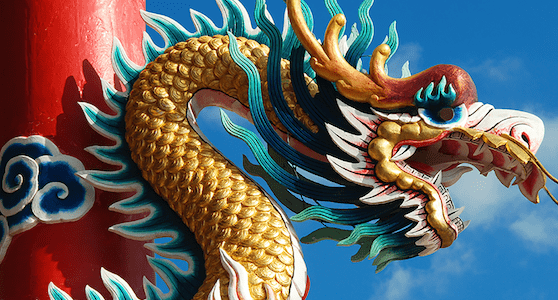 Stock markets give an estimate of investors’ view of a country’s economic potential. 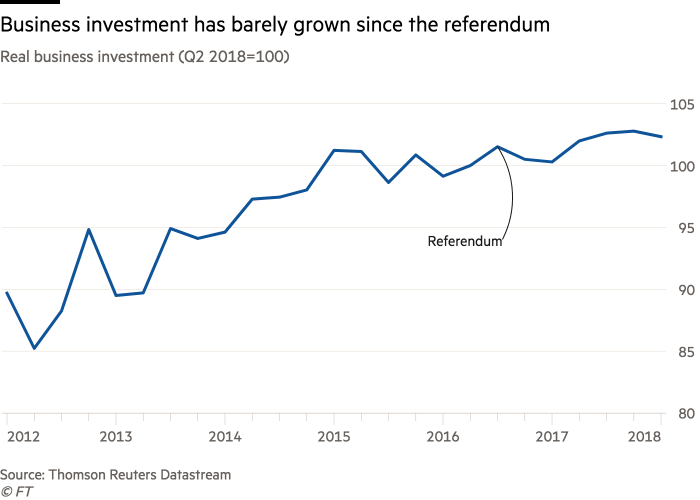 International investment in UK shares, best measured in dollar terms by the FTSE 250 index, which comprises companies that primarily do business within the UK, has done reasonably well since the 2016 Brexit vote, increasing by 6 per cent. 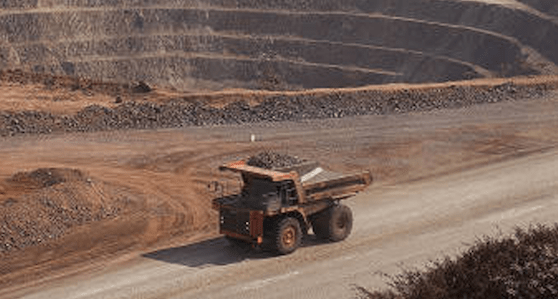 But the stock markets of other developed economies have risen 28 per cent over the same period, showing that investors have devalued UK assets.